Secondary English Teachers are involved in preparing and educating students of middle, high and postsecondary schools. English Teachers at this level teach punctuation, grammar, writing, and understanding of books, literature, and reading comprehension. 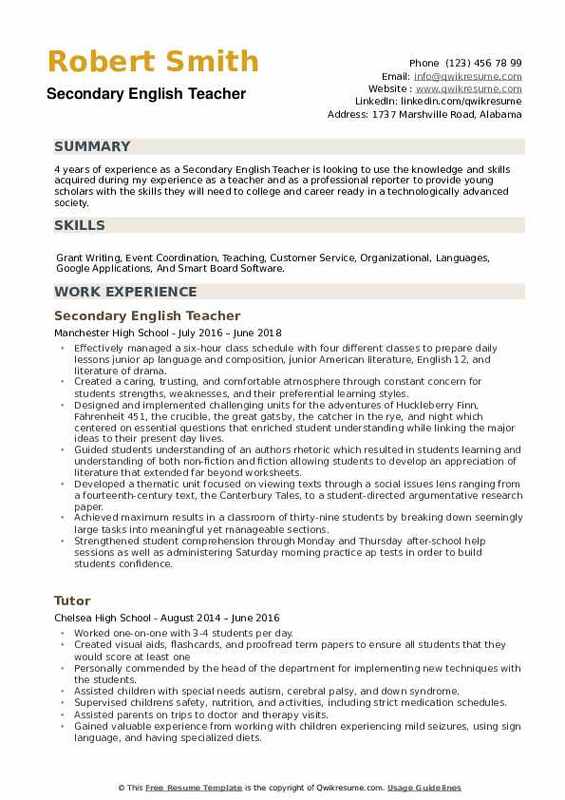 The duties of an English Teacher is just similar to that of any Teacher and includes the following in the Secondary English Teacher Resume – creating lesson plans, tracking the progress of the student, to enhance the vocabulary, spelling and comprehension abilities of the student and conducting essays and quiz to assess the ability of students. English Teachers must demonstrate outstanding vocabularies, have a firm grasp of pronunciation and spelling, have the ability to break down words phonetically, showcase strong command over grammar and sentence structure rules, and be comfortable speaking in front of large crowd. Job opportunities are bright for candidates having a Master’s degree with Specialization in English. Headline : 5 years of experience as a Secondary English Teacher. Dedicated professional experienced in diverse and fast-paced environments seeks a position in an organization where strengths in strategy and leadership will be applied to further the goals of the team. Skills : Experienced With MS Office: Creating/modifying Documents/spreadsheets Using Word, Excel, And PowerPoint. Complete all grading, create progress reports and conduct parent conferences in a timely manner. Review curriculum and devise alternate approaches to presenting lessons to increase student understanding (working directly with students and parents). Communicate with parents, students, and other teachers on a regular basis to develop and update personal learning plans and schedules, score assessments, provide feedback on student work, suggest instructional approaches and strategies, monitor completion of assignments and coach special projects. Work collaboratively with other teachers to ensure that all students are successfully progressing through the program, that parents have a central point of contact, and that tasks are distributed among the teachers. Develop a general knowledge of the entire program’s k-12 curriculum and a very detailed knowledge of the courses for which responsible. Communicate regularly with parents, students, and curriculum specialists through the use of a computer and telephone. Consult with other teachers and staff learning specialists to develop alternate enrichment activities and modifications to students’ programs to increase student understanding. Work with other teachers to coordinate social activities and relevant field trips for students. Headline : 7+ years of experience as a Secondary English Teacher. Dedicated to creating a work environment that is engaging and focused on success. An active participant in the professional community. Skills : Microsoft Office, Proficient In Microsoft Office Programs, Mac OS X, Google Applications, And Smart Board Software. Worked with co-teacher to create innovative education environment options within the school for students in the "fusion class" program. Worked with students to fundraise approximately $10,000 for class activities annually. Established "houses" for student learning groups based on personality and learning. Used "weekly reports" to receive regular student feedback on class, comprehension, and other needs. Responsible for planning regular school activities including dances, service projects, fund. Responsible for managing budgets for the student government and tracking funds raised by various sources. Took students on overnight retreats, including trips planned completely by the school instead of outside organizations. Organized in-school mentoring program for all teachers to observe other classrooms with the goal of self-improvement. Counseled with teachers looking for help with specific student issues. Led groups of 50+ to the Utah Shakespeare festival for a two-three day overnight retreat. Recruited students to come with their families so that the trip could be a family experience. Arranged with school for attendees to earn English credit by attending classes and the plays with the festival. 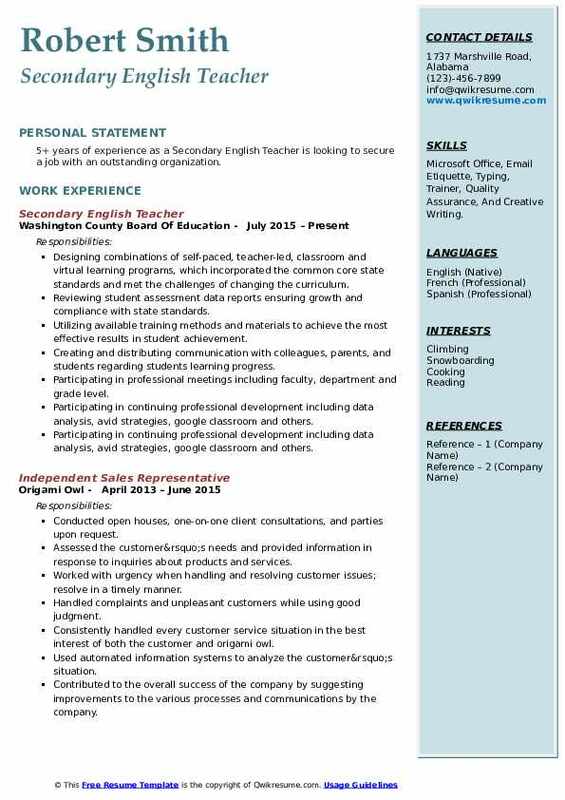 Skills : Experienced Computer Knowledge, Microsoft Office, Email Etiquette, Typing, Trainer, Quality Assurance, And Creative Writing. Teaching content and skills in English language, literature, and composition, as well as in reading to high school students, utilizing course of study adopted by the Texas board of education. Instructing students in citizenship, basic communication skills, and other general elements of the course of study common to all teachers, as specified in state law, administrative regulations and procedures of the school district. Adapting English material and methods to develop relevant sequential assignments that guide and challenge students. Determining instructional materials designed to achieve instructional goals and behavioral objectives. Selects books and instructional aids appropriate to the interest and maturity level of students. Providing individual and small group instruction in order to adapt the curriculum to the needs of each student. Provides remedial programs for students who have not achieved language competency commensurate with their potential. Developing standards for critical analysis through group discussions based on a variety of mass media and classical and contemporary literature. Encouraging students to think independently and to express original ideas. Evaluating each student progress in English skills (listening, speaking, reading, and writing) and prepares progress reports. Summary : 12+ years of experience as a Secondary English Teacher is looking to obtain a coordinator position and further develop the online and social media presence in conjunction with a progressive marketing strategy to expand the reach of Big Dog Ranch Rescue. 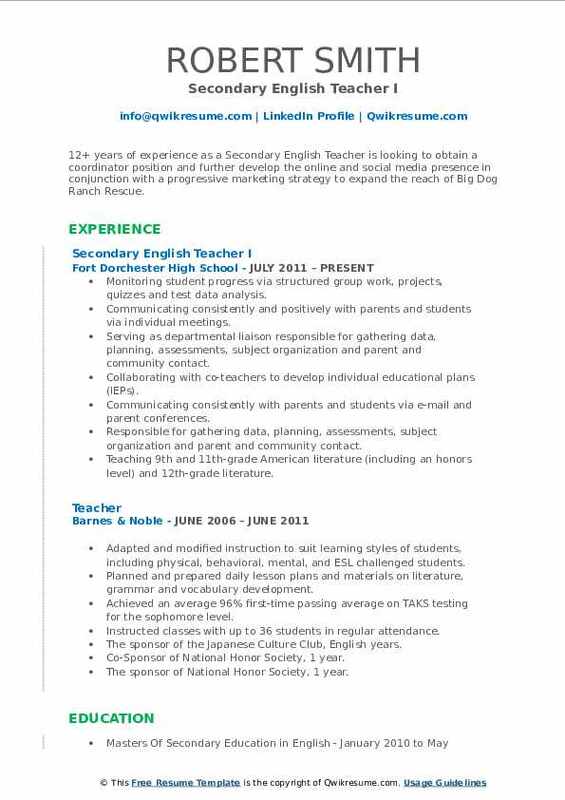 Skills : Event Planning, Lesson Planning, Curriculum Development, Organizational, Microsoft Word, And PowerPoint. Monitoring student progress via structured group work, projects, quizzes and test data analysis. Communicating consistently and positively with parents and students via individual meetings. Serving as departmental liaison responsible for gathering data, planning, assessments, subject organization and parent and community contact. Collaborating with co-teachers to develop individual educational plans (IEPs). Communicating consistently with parents and students via e-mail and parent conferences. Responsible for gathering data, planning, assessments, subject organization and parent and community contact. Teaching 9th and 11th-grade American literature (including an honors level) and 12th-grade literature. Providing English lessons and tutoring to elementary school students and youth in the community. 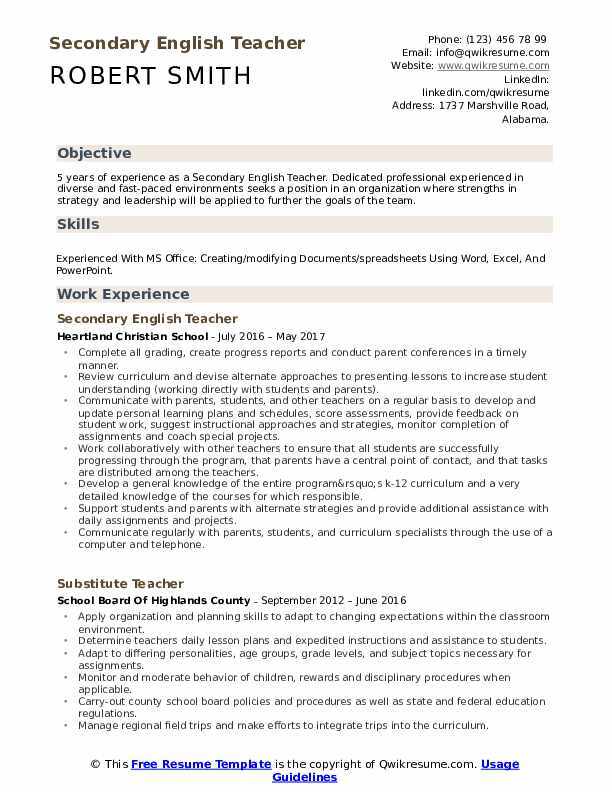 Headline : 5+ years of experience as a Secondary English Teacher is looking to secure a job with an outstanding organization. Skills : Microsoft Office, Email Etiquette, Typing, Trainer, Quality Assurance, And Creative Writing. Designing combinations of self-paced, teacher-led, classroom and virtual learning programs, which incorporated the common core state standards and met the challenges of changing the curriculum. Reviewing student assessment data reports ensuring growth and compliance with state standards. Utilizing available training methods and materials to achieve the most effective results in student achievement. Creating and distributing communication with colleagues, parents, and students regarding students learning progress. Participating in professional meetings including faculty, department and grade level. Participating in continuing professional development including data analysis, avid strategies, google classroom and others. Leading learning enhancement classes focused on improving academic and people skills needed for success in the workforce. Instructing through lectures, discussions, and demonstrations in integrated technology into each training session such as the smartboard. Conducting small group and individual activities based on differentiated learning needs. Summary : 8 years of experience as a Secondary English Teacher. A flexible and adaptable individual seeking to apply administrative, organizational, employee relations and recruiting skills to an entry level HR position. Experienced in employee recruitment and retention, staff development, mediation, conflict resolution, benefits and compensation, HR records management, HR policies development and legal compliance. Skills : Data Processing, Microsoft Office, Windows 98/Vista/7, Basic Windows, Windows XP, Excel, Word, Access, PowerPoint, Written Correspondence, Classroom Experience, And Extremely Organized. Function as a Facilitator or coach, using interactive discussions and "hands-on" approaches to help students learn and apply concepts in English. Utilize "props" or "manipulative" to help children understand abstract concepts, solve problems, and develop critical thought processes. Encourage collaboration in solving problems, students are increasingly working in groups to discuss and solve problems together. Preparing students for the future workforce is a major stimulus generating changes in education. Prepare students to interact with others, adapt to new technology, and think through problems logically. Provide the tools and the environment for students to develop these skills. Plans and implements a program of instruction that adheres to the district philosophy, goals and objectives as outlined in the adopted course study. Plans and implements a program of study designed to meet individual needs of students. Encourage student enthusiasm for the learning process and the development of good study habits. Prepares a substitute folder containing appropriate information as required by the principal. Plans and prescribes purposeful assignments for paraprofessionals, tutors, and volunteers as needed. 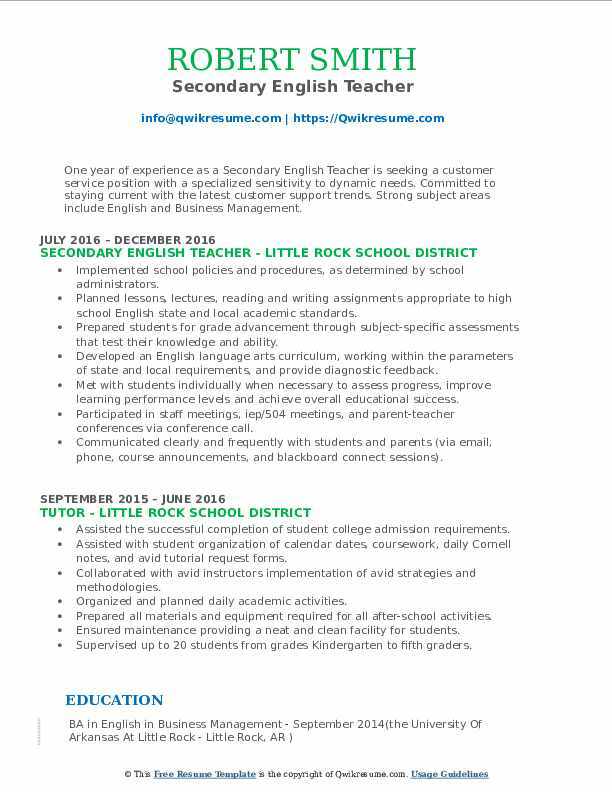 Objective : One year of experience as a Secondary English Teacher is seeking a customer service position with a specialized sensitivity to dynamic needs. Committed to staying current with the latest customer support trends. Strong subject areas include English and Business Management. Skills : Microsoft Office, Sales Management, Curriculum Development, And Customer Relationship Management. Implemented school policies and procedures, as determined by school administrators. Planned lessons, lectures, reading and writing assignments appropriate to high school English state and local academic standards. Prepared students for grade advancement through subject-specific assessments that test their knowledge and ability. Developed an English language arts curriculum, working within the parameters of state and local requirements, and provide diagnostic feedback. Met with students individually when necessary to assess progress, improve learning performance levels and achieve overall educational success. Participated in staff meetings, iep/504 meetings, and parent-teacher conferences via conference call. Communicated clearly and frequently with students and parents (via email, phone, course announcements, and blackboard connect sessions). Coordinated as a team with other high school staff to proctor state-mandated exams (act aspire). Utilized pre-and post-test data to track students progress twice per quarter. 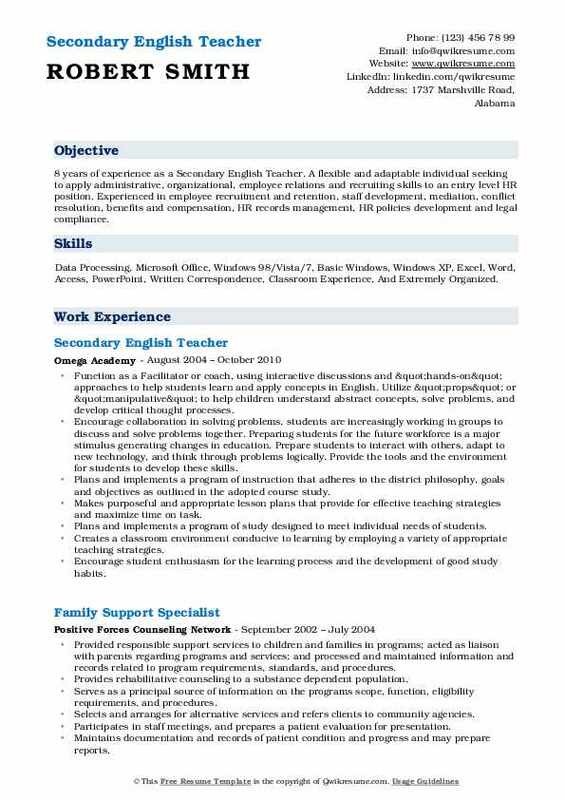 Objective : 4 years of experience as a Secondary English Teacher is seeking to obtain a career working where my educational background, organizational skills, and creativity can be used in the field of Manufacturing Production. Skills : Special Education, Math, Microsoft Office, OpenOffice, Excel, PowerPoint, Prezi, Google Drive, IPad, iMovie, And ESRI Geographic Info. System. Facilitated and mentored teacher training on classroom management, curriculum/lesson. Planning, and program activities with counterparts to create sustainable teaching. Remolded and designed communicative EFL lessons and curriculum emphasizing basic. Reading, writing, speaking, and listening skills in the near absence of educational. Spearheaded and implemented a weekly after-school English language club creative. Collaborated with fellow colleagues for preparation of i-glow/i-bro camps to surrounding middle and high school students to improve and support girls access to. Develop activities and integrated technology to diversify instruction. Collaborate with teachers and administrators to discuss the academic needs of students. 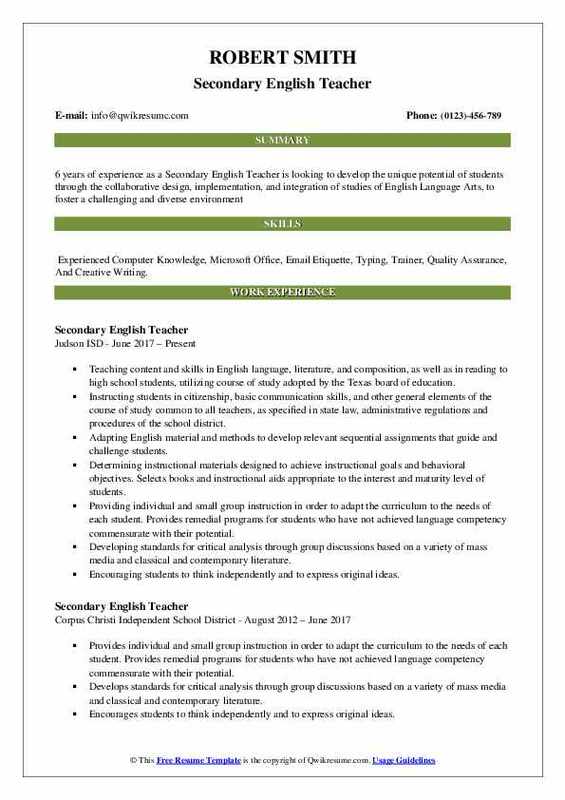 Summary : 12+ years of experience as a Secondary English Teacher is looking to obtain a career that allows me an opportunity to utilize the skills gained through my degree work and previous work experience in order to make an immediate contribution to the companys mission. 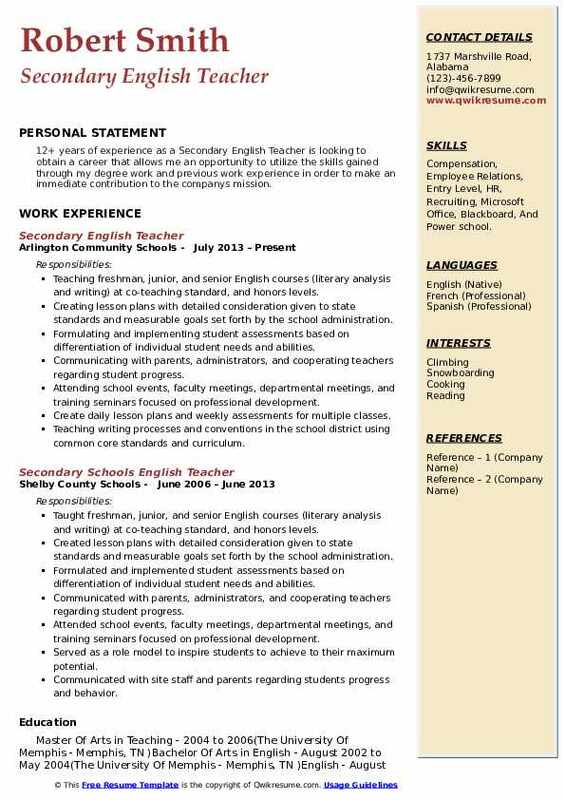 Skills : Compensation, Employee Relations, Entry Level, HR, Recruiting, Microsoft Office, Blackboard, And Power school. Teaching freshman, junior, and senior English courses (literary analysis and writing) at co-teaching standard, and honors levels. Creating lesson plans with detailed consideration given to state standards and measurable goals set forth by the school administration. Formulating and implementing student assessments based on differentiation of individual student needs and abilities. Communicating with parents, administrators, and cooperating teachers regarding student progress. Attending school events, faculty meetings, departmental meetings, and training seminars focused on professional development. Create daily lesson plans and weekly assessments for multiple classes. Teaching writing processes and conventions in the school district using common core standards and curriculum. Reducing behavioral challenges in students through the implementation of strong classroom management skills. 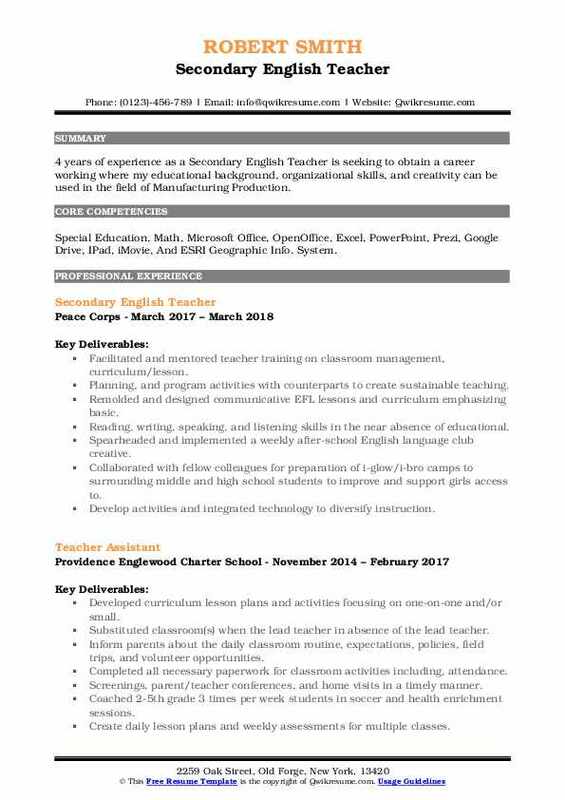 Objective : 4 years of experience as a Secondary English Teacher is looking to use the knowledge and skills acquired during my experience as a teacher and as a professional reporter to provide young scholars with the skills they will need to college and career ready in a technologically advanced society. 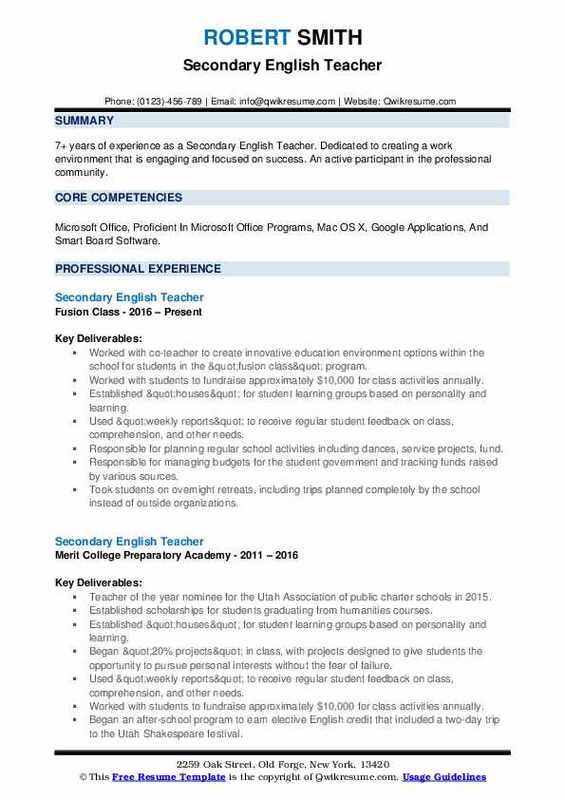 Skills : Grant Writing, Event Coordination, Teaching, Customer Service, Organizational, Languages, Google Applications, And Smart Board Software. Effectively managed a six-hour class schedule with four different classes to prepare daily lessons: junior ap language and composition, junior American literature, English 12, and literature of drama. Created a caring, trusting, and comfortable atmosphere through constant concern for students strengths, weaknesses, and their preferential learning styles. Designed and implemented challenging units for the adventures of Huckleberry Finn, Fahrenheit 451, the crucible, the great gatsby, the catcher in the rye, and night which centered on essential questions that enriched student understanding while linking the major ideas to their present day lives. Guided students understanding of an authors rhetoric which resulted in students learning and understanding of both non-fiction and fiction allowing students to develop an appreciation of literature that extended far beyond worksheets. Developed a thematic unit focused on viewing texts through a social issues lens ranging from a fourteenth-century text, the Canterbury Tales, to a student-directed argumentative research paper. Achieved maximum results in a classroom of thirty-nine students by breaking down seemingly large tasks into meaningful yet manageable sections. Strengthened student comprehension through Monday and Thursday after-school help sessions as well as administering Saturday morning practice ap tests in order to build students confidence.